I remember exactly where I was when Marian Hossa was traded to the Pittsburgh Penguins. The year was 2008, and I was a senior in high school. It was late February, and I remember walking into hockey practice like I did every other school day at 5 a.m., only to look up at the TV in our locker room and read “Penguins trade for Marian Hossa” on SportsCenter. Now, growing up in Traverse City, Michigan, Penguins fans were far and few between. Pretty much all of my teammates were Red Wings fans, and I remember a lot of them being salty that Sidney Crosby, who was only in his third NHL season, would be getting to play alongside Hossa. Any hockey fan knows how the story goes for Hossa. The Penguins get beat by the Red Wings in game 7 of the Stanley Cup Finals, so the next offseason Hossa signs with Detroit. Then, the Penguins earn their redemption against Detroit the very next year, and Hossa is once again left on the short end of a game 7 Stanley Cup Finals loss; however, he eventually finds a home with Chicago, and I’d say – after three rings in six seasons with the Hawks – that he’s doing okay. Not for a second did I actually believe that the other player we received from the Atlanta Thrashers in that now infamous 2008 trade would end up becoming a staple to the Penguins franchise for the next seven years. I remember when I figured out the exact details of the trade, my first thought was “who the hell is Pascal Doo… Doo… Doopwess?” I didn’t even know how to pronounce his last name. He played for the Thrashers – the irrelevant try-hards of the NHL, there was no reason to know his name. He had been in the NHL since 2001, even recording a then career-high 48-point season in 2002-03 with the Minnesota Wild, but I had never heard of him, and I don’t think I was in the minority there. I remember being more upset that we lost Colby Armstrong than happy about what Dupuis brought to the table. After seeing him in black and gold for the first time during the 2008 season, I remember thinking that he would be a good filler. Third and fourth line guy who will be easily replaceable – nothing more. In 2008, he helped lead the Pens to their first Stanley Cup Finals appearance since the early 1990s, and while they ended up on the short end of that series, it was what happened in the offseason that really bothered a lot of us. Like I mentioned earlier, Hossa left us. Now we were left with some undrafted 30-year-old winger coming off a 27-point regular season. This was going to be a disaster. It would take a few years for Dupuis to really get moving in Pittsburgh, but once he found a home playing alongside Crosby and Chris Kunitz, it all started to click. When they were all healthy, there might not have been a line in the NHL with more chemistry. Sure, there were combinations around the league that showed off more pure talent then these three, but watching the three of them click was like watching poetry in motion. The 2011-12 season, in which he accumulated 25 goals and 34 assists without missing a single regular season game, would be the best season of Dupuis’ career. Had it not been for a lockout-shortened 2012-13 season, he probably would have had an even bigger year than the one prior. In that 48-game span, Dupuis notched 38 points, and established himself as one of the most dangerous wingers in the NHL. 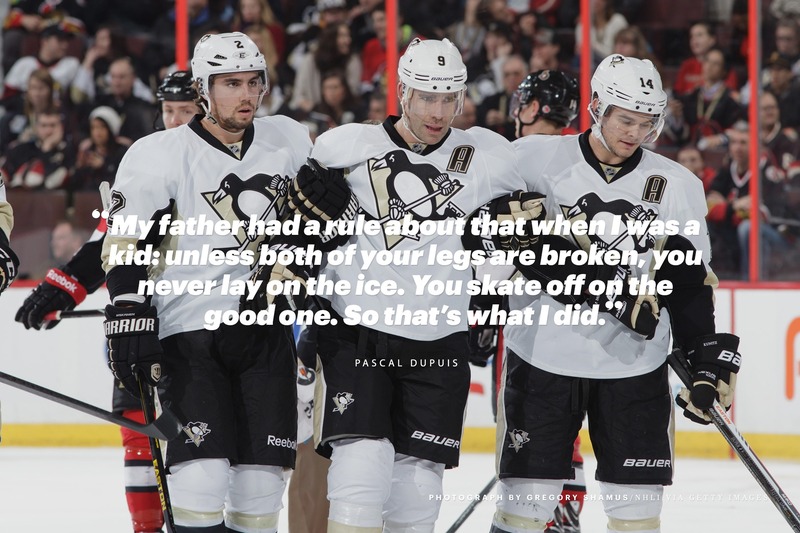 One of the things that made Dupuis so incredible was his longevity and his resilience. Every player battles injuries throughout the season, whether they’re reported or not, and the fact that Dupuis only missed two regular season games from 2009-2012 is absurd. Four seasons, two games missed. That’s the kind of thing that you rarely see in today’s game. It was clear that Dupuis was a catalyst to the Pens’ success on the ice, but when HBO did their 24/7 special leading up to the Winter Classic between the Washington Capitals and the Penguins, fans got to see what kind of person he was as well. After talking about how difficult being a professional athlete can be because it forces you to take extended time periods away from your family, you could see that Dupuis was not just a hell of a hockey player, but also a very loving father and husband. In today’s society, there has been so much focus on athletes who don’t really fit the mold of a role model, but Dupuis stood out in the 24/7 HBO special because you could see how genuine of a person he really was around his family, coaches, and teammates. All was right in Pittsburgh. Even after two breakout seasons, Dupuis had the option to shop the market for a big contract in the 2013 offseason, but he decided to stay at home and sign a four-year deal with the Penguins, pretty much guaranteeing that he would be with Pittsburgh until he retired. I just don’t think any of us thought that day would come so soon. Right as Dupuis was emerging as a star, his health started to go, and the guy who seemingly could not get hurt, all of a sudden could not stay healthy. The downward spiral began two days before Christmas in 2013. Ottawa Senators defenseman Marc Methot would lay a hip check on Crosby, which sent him into Dupuis, who was crashing the net. Crosby’s skate would miss Dupuis’ face by only a couple of inches, but also made his knee buckle under him, which caused Dupuis to tear his right anterior cruciate ligament. Seven weeks later, Dupuis underwent surgery to repair his ACL. Later in 2013, Dupuis would be taken off the ice on a stretcher after being struck with a puck in the back of the neck, which was fired from teammate Kris Letang. He would return just days later, but it was a scary moment for sure. 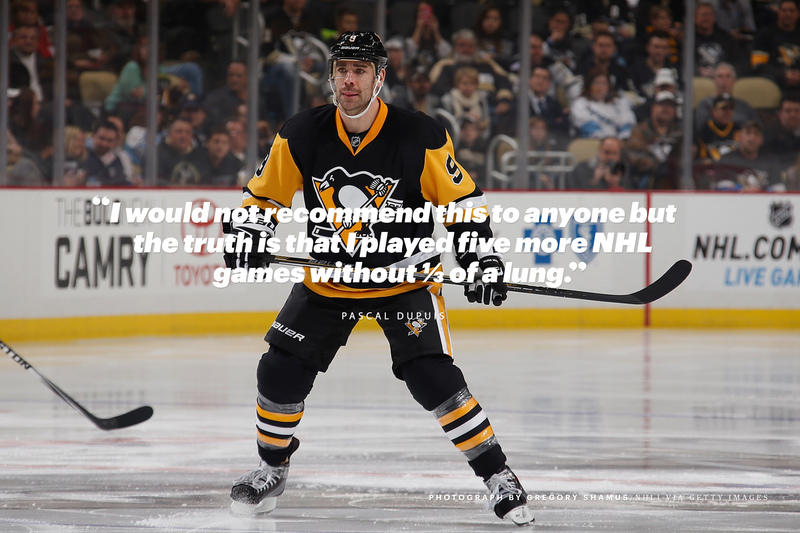 November 2014, Dupuis was diagnosed with the blood clot that would eventually end his career – the clot had started in his leg and travelled up to his lung. Dupuis had been taking blood thinners for six months while rehabilitating his knee, but when the clot returned, his diagnosis turned more serious. This season, Dupuis has done his best. He’s played in 18 games, added four points, but has missed action on two separate occasions due to complications dealing with his blood clots. Yesterday, December 8th, 2015, Dupuis called it a career. It was a difficult pill for us to swallow. Dupuis has been one of the key components to the Penguins’ success since being acquired from Atlanta, and while he almost always seemed to be lurking in the shadows, his contributions were endless. It was only fitting that a guy would be overlooked in the trade that brought him to Pittsburgh, spent the majority of his career being overlooked by his superstar teammates. But that never mattered to him. He just wanted to contribute. He was one of the few guys who showed up to play every shift. This is a guy who once pulled out two of his own teeth on the bench and didn’t miss a minute of ice time. A guy who was overshadowed by stars like Crosby and Evgeni Malkin, but continued to be a leader behind closed doors. A guy who was loved by the media, and adored by his teammates. A guy who cut his career early because he wants to be there for his wife and be able to see his four children grow up. All in all, a selfless act by a guy who will likely never be forgotten in Pittsburgh. For me personally, he went from a guy whose last name I couldn’t pronounce to one of my favorite players to ever wear the black and gold. Thanks for everything, Pascal. Stay healthy and let’s go Pens.